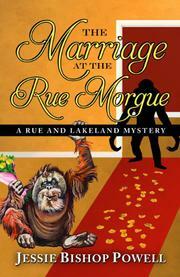 An escaped orangutan and a grisly murder blight a longtime pair’s wedding in this nod to Edgar Allan Poe. A piece of flying chimp poop isn’t exactly the stuff of romance. But for Lance Lakeland and Noel Rue, it’s part of the workaday world of the Midwest Primate Sanctuary in Ironweed, Ohio. When a new arrival, a powerful and agitated orangutan, escapes its crate, Rue and Lance would ordinarily stay to help Art Hooper, the impulsive but bighearted director of the sanctuary, capture the escapee humanely. But the couple is getting married the next day, and Art sends them on their way to deal with the trifling items—the marriage license, the dress fitting and most of the decorations—they’ve left till the last minute. A further complication is that Lance’s brother, who is also Rue’s former boyfriend, is coming to the wedding, along with Lance’s nightmarish mother-in-law-to-be. In the midst of wedding plans, the couple is called back to the sanctuary, where a bloodied and dying Art lies covered with orangutan hair. Rue is almost too upset to go through with the ceremony, but Lance won’t hear of postponing it, even though he’s just lost his boss and best man. When he and Rue try to make sense of Art’s last words and figure out why he was going to collect a video just before he died, they’re sucked into a homicidal and nuptial swirl of sanctuary secrets, bridesmaids’ crises and family antics. In this series debut, Powell (Divorce: A Love Story, 2011) bounces from arch humor to tragedy and back again. Lovably eccentric characters maintain a slight edge over sentimentality in what is most likely the finest simian cozy to date.